Can’t sleep at night? Well, it’s nothing unusual if you have a sleeping problem. Many people have this insomniac tendency due to various reasons like snoring sound, noisy street, pets, and neighbors or just simply because they are a light sleeper. Solving these problems is really easy. There’s absolutely no need for any kind of medication or whatsoever. All you need to do is use noise cancelling headphones or earbuds for sleeping. Headphones and earbuds are a good way to go if you want a perfect sleeping schedule. According to recent research, you can sleep better with a constant sound. Just imagine a scenario, where you’re enjoying your favorite track while falling asleep and having the perfect night ever! Wouldn’t that be great? And so, using noise cancellation earbuds for sleeping can be the perfect measure for you. That’s why this article will cover all you need to know about using headphones and earbuds while sleeping and include some of the best choices only for you. 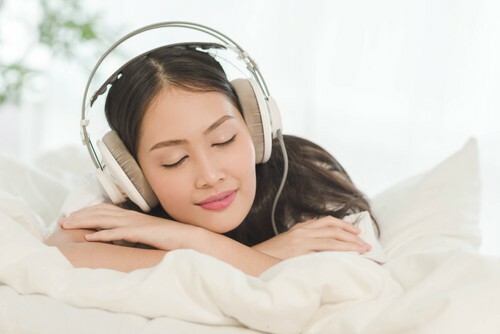 Typically most of us favor a silent environment for sleeping, but there are a few exceptions who just can’t go to sleep without hearing some relaxing music. There could be many reasons for that such as traffics, noisy roommates or pets. Whatever your reasons may be there’s nothing a great pair of headphones can’t fix. So, if you are one of those light sleepers, then you should definitely try out wearing headphones while you sleep. Although finding the perfect pair is not that easy. The one thing that should matter the most is the comfort and noise cancellation quality. If your headphones or earbuds lack even one of these, they really won’t make much of a difference. Sleep Headphones and Earbuds: Are They Safe? Thankfully sleep headphones and earbuds are designed to be perfect for using while you sleep. If you are wondering whether they are safe or not, you don’t need to worry. They are safe for regular use, although they might cause excessive earwax. But this is not something you couldn’t actually deal with. So, at the end, they are indeed a useful tool if you don’t mind the earwax problem. They would provide some extra pressure on your ear while you sleep but it’s not something that would bother you from sleeping. So, safety should not to much of concern when you are using one of these. Comfort is also an important feature to consider before getting noise cancelling headphones or earbuds. In the end, you are going to have to sleep with them on your head. Maybe this doesn’t sound too pleasant, but in fact, they are actually pretty good when it comes to comfort. On the other hand, to provide a better experience, these headphones come as thin as they can which allows you to sleep even in sideways. They are also covered with foam for extra comfort while you sleep. Sound quality is another factor you should consider before going for a noise cancellation earbuds for sleeping purposes. If the earbuds or headphones don’t have a good sound quality, then they won’t indeed serve its purpose. That being said, most of the sleep headphones have a sound quality just above average. They won’t give you any high-quality sound effects, but they will cancel the surrounding noise giving you just the exact amount of volume you need. So, it’s a win-win situation. One of the best noise cancelling headphones is AcousticSheep Sleep Phone. The most amazing part of these headphones is you can use them as both headphone and headband for noise-free sleeping. You can remove and also adjust them whenever you want. Sometimes you may have problems sleeping with wired ones. But with these wireless headphones, you don’t need to worry about the wires anymore. It’s so comfortable that it’ll make you even forget that you are wearing it. Using it is pretty easy. You just have to connect it to your phone via Bluetooth. Depending on the volume the battery will provide you 10 to 13 hours of service if it’s fully charged. The battery pack is really small and removable. You can even wash the headband. But you must take care of all the headphone parts. Never forget to remove them before washing. Sound sleep requires the best comfort. CozyPhone Sleep Headphones are the ultimate comfortable noise cancelling headphones for sleeping. Nothing can beat it with its comfort. Though this is wired, it doesn’t bother when you get the best comfort for sleeping noiseless. The secret behind the comfort is a material called Lycra. This material made this product a perfect choice for using it as a headband too. This band is so comfortable that you can even use it in the hot summer night and you don’t have to bother or feel uncomfortable. You can easily use them as a sleep mask. Its speakers are also removable and adjustable for your comfort. They are so comfortable that they won’t bother you at all while sleeping on any side. You won’t regret the sound. The sound system is perfect for a noise cancelling headphone for sleeping. It will provide you the best comfort with the best noiseless sound sleep. You just need to adjust the volume to your wish. If you are facing problems while sleeping because of the noise, then it’s absolutely perfect for you. The CozyPhones Headphones are also available for kids. It’s kind of a weird name, right? These headphones are made of fleece. With the Tooks Sportec, you don’t have to worry about sleeping on your side. Took Sportec has amazing comfortable headphones. They don’t disturb your ears in any way and make you feel so much comfortable. Its amazing design will let you sleep noiseless with a very classy volume of music. The wire can be a bit of a problem sometimes, but it’s not something you can’t handle. The sound quality won’t disappoint you as its quality is higher than its previous versions. Besides, for peaceful sleeping, you don’t need a volume level like a concert. Bose QuietComfort 20 is one of the best noise cancelling earbuds for sleeping with exclusive design. They are comfortable to put in ears while sleeping as the buds are a little pointy. This makes it better for cancelling noise while you’re sleeping. The sticking out pointy-looking things are actually the wings. To hold your earbuds the wings brace against the cup of your outer ears. This makes the noise cancellation even better. They make you feel comfortable as they don’t press against your ear canal. The best part of this earbuds is its active noise cancelling feature. This feature makes it stand out from the crowd. In this case, it is unbeatable. Coming with an exceptional design, it truly excels at providing a noiseless night. But you can be disappointed by its sound quality. The sound quality is not that much good but still, it will help you sleep peacefully by cancelling any side noise. If you live in a noisy place, it will remove all the noise and help you sleep comfortably. It doesn’t matter how high the noise is, these earbuds can certainly cancel them 100%. Maxrock Unique Total Soft Silicon Super Comfortable Sleeping Headphones are usually too small and that makes them unique. The best part is they weigh just 0.3 ounces. Anyone can hardly notice when you put them in your ears. They have small housing and this housing has super-small 5mm speakers inside it, which makes them extremely comfortable causing no distress at all. They may not be much durable or their sound quality is not that good enough, but they will offer you extremely comfortable noiseless sound sleep. These are one of the best earbuds from TaoTronics, a very popular brand. Integrated with active noise cancellation technology these earbuds can be your premium choice for sleeping. Not only their sound quality but also their outstanding design makes them suitable for any situation. Their design is really unique with a Y shaped cable along with a mic. You’ll also get a mode regulator with noise cancellation feature. Whenever you want active noise cancellation you just have to turn it on and you’ll get rid of any noisy environment. As for comfort, TaoTronic made the earpieces with soft silicon which snugs right into your ear without any amount of discomfort. Being extremely lightweight, they provide zero pressure on your ears. So, you can go to sound sleep without any distress. The only lacking is the sound quality. They are more than average but not cut out for your regular day to day quality earbuds. But they are a perfect choice if you want a pair just for sleeping. A durable product for its price. Noise can cancellation up to 25 dB. Cable might cause a bit problem while sleeping. Why Should You Use These Headphones and Earbuds? If you are using noise cancelling earbuds for sleeping then you would be blocking out most of the unwanted noises around you. Though there are limits to their cancellation power but overall all of them perform really great. Generally, people hear loud music just to isolate from the surrounding noises. This process is not healthy at all. If you hear loud music on daily basis, it can hamper your hearing ability pretty bad. But these unique noise cancelling earbuds and headphones would isolate the surrounding noises without higher volume. A great solution to the health issue. These noise cancelling headphones are not only great for sleeping but also a great companion while you are traveling. You can easily use them while you are on the bus or plane or train. It will help you cancel out all the surrounding noises and concentrate on more important matters. They can be a great companion even when you study. Students who live in dorms or hostels get easily distracted by their surroundings which actually hampers their study. But these headphones can easily help them block the noisy environment and study with full concentration. If you are really suffering from sleep problems then you should definitely try out these noise cancellation headphones and earbuds for sleeping. Being really comfortable these headphones can provide the noise cancellation you need for a great sound sleep. Try them out now and have a golden night full of silence and sleep. Why don’t you share what you experience? Let us know in the comments below. Soundproofliving.com is a participant in the Amazon Services LLC Associates Program, an affiliate advertising program designed to provide a means for sites to earn advertising fees by advertising and linking to Amazon.com.